Having a shallow connection with a girl you don't really care for. In other terms, it's very common for an ex to try to degrade whatever love or romance you are experiencing. As you can imagine, that's absolute, total non sense! It's a competitive response from her. You have to let your ex go and be ok with whatever emotional reaction she's having. You simply don't have to listen! You are doing what's right by dating this new girl. Right now, your ex's attitude is TOXIC! Don't contact her for a while. Stay away from her as much as possible if you don't want her to negatively impact on the fun you experience now. Right now she's like a virus! Labels: break up for men, break up for men articles, Is it wrong to meet her?, My ex is super angry with me, No contact? Going to a first date when you didn't do that for a long time can be quite disabling! Once you develop it, whether it's the first girl after break up or a old lady you chat with at the bus stop, the principles are the same. The key with new dates is to have other options. If she's your only hope, she feels it and it makes you appear needy. It does work for many! The fact that a marriage ends doesn't mean that it didn't work. That's up to you decide. Realize that this simple concept deeply conflicts with the traditional romantic dream that suggests that "love is forever". You might still "love" someone you dated 10 years ago. It doesn't necessarily mean that you will marry the person or that you are compatible for building a committed relationship. People often marry too early because they are afraid of what will happen if they don't. Be respectful and diplomatic and don't dive in processing mode. Your ex is not your therapist. She might be a casual friend you see here and there but don't expect too much from her. The best is to keep all conversations light and easy. Talk about casual things, nothing too serious or too deep. Each time you share something deep and real about your feelings, you give her an access door to your emotions. This connects her deeper to you and makes it harder for you to forget about her. Don't force her to listen to your new love stories. She thought of herself first when taking that step! Did she care about how THAT would make YOU feel? So, why are you still trying to protect her?? There is nothing in your life that belongs to her! You don't have to protect her, you don't have to even share what you experience with other women. She has no right to expect anything from you or limit you in any way! DON'T LET HER DO THAT TO YOU! RESPECT YOUR NEEDS MORE THAN HERS! She might say she wants to stay friends but then doesn't act accordingly. Look at her actions, rather than what she says. Her actions speak louder than her words. So, if she sends you one text message a week, that tells you exactly how much time and energy she wants to invest in a friendship with you right now. Invest less or the same as what she does, certainly not more or you will end up losing yourself and getting deeply frustrated. You are free! You are dating new women. It drains your energy, destroys your confidence and the chemistry you could establish with the new women you date. Nothing and no one will stop me from meeting fantastic women and developing new relationships! Remember that in your ex's mind she might want to keep you were you are. It IS a battle for power and happiness, and even if you want to stay friends, she is usually on your way, when you try to meet someone else. She might judge silently what you do with your love life or resent it. Test the waters and find out what you can share and what you can't. If you want to bring new women in your life, it's important NOT to see your ex or communicate with her too much. 30 days! Give yourself 30 days to find all the answers you need and let go of your ex! Before you can move on, you usually need to know why the break up happened and if there is anything that you could have done differently. Most break ups are an opportunity to discover something deep about yourself, like how you stand in life and the profound values you live for. In these initial 30 days, don't jump in a new committed relationship. You need some time first to regroup your energy and find yourself back. When the break up happens, make a note on your agenda 30 days from the break up date saying something like "FULL RECOVERY" or "NEW LIFE START". Having this date in your future will keep you focused and set up the starting point to your new life! 90% of the solution is the mind! Realize that this is a battle! Nothing and no one will stop you from being happy! Happiness is a space you need to fight for! It's like a territory to conquer! The first essential strategy is damage control. It means that a break up can have a devastating snowball effect and negatively impact on these other areas of your life. Realize that your life is under attack and shift to battle mode! This is a fight for survival and emotional victory! Stay focused on what you are paid for. Your core guidelines for wellness and vitality are always the same but when a break up hits you, the risk of tapping in unhealthy patterns is way higher. You might feel like you run out of will power and stop fighting. Wake up and fight back! When you meet new people, don't bring up your break up in conversations. Focus on fun things instead. If you need to share about your break up, select a special time with a close friend, a coach or therapist. This gives you a safe space to dive into it, get fresh perspectives and a solid power kick. 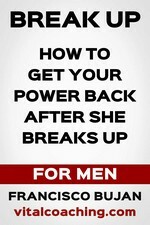 Both women and men get often hit really hard by a break up. Because the vision they had for their lives suddenly collapses. Imagine that you build up a perfect picture of your future with a given person and suddenly it's gone! This is why it is so hard to deal with. It is because it requires a profound shift in your long term life vision. A break up means change! Of course you have your fears, shame and what others will say about it. Somehow guilt can build up and doubts about your self worth creep in too. The core idea is that a break up is the end, death or destruction of something you cared for. This core energetic shift creates stress and forces you to adapt to a whole new life condition in which the essential qualities of love, nurturing and mutual support might be dissolved. You go from being in resonance with another human being to relying just on yourself. The depression or the break up zone that tries to hit you at that moment is the reflection of that loss. Labels: break up for men, break up for men articles, Why is it so hard?